Made in the USA quality, super-affordable price. The missing link-between a quality, made-in-the-USA knife and a price most consumers can afford-has been found. Or, to be more precise, Kershaw is making it. Appropriately, they call it the Link and have given it the patriotic model number of 1776. This Link, model 1776GRYBW, is their drop-point blade model. Made in the USA quality, super-affordable price. The missing link-between a quality, made-in-the-USA knife and a price most consumers can afford-has been found. Or, to be more precise, Kershaw is making it. Appropriately, they call it the Link and have given it the patriotic model number of 1776. This Link, model 1776GRYBW, is their drop-point blade model. The 420HC stainless blade steel has higher amounts of carbon and chromium to boost hardenability and corrosion resistance. It is an excellent everyday steel: tough, corrosion resistant, easy to sharpen and takes a good edge. Our BlackWash finish gives the blade the well worn look of your favorite pair of jeans and offers additional blade protection. The handles are machined from lightweight aluminum and anodized dark grey. The sculpted lines of the handle provide for a comfortable and secure grip. It feels big and solid in the hand and offers a clean look. For easy opening, the Link is equipped with SpeedSafe assisted opening, accessed with the built-in flipper. The pocketclip is reversible for convenient left or right-handed pocket carry. 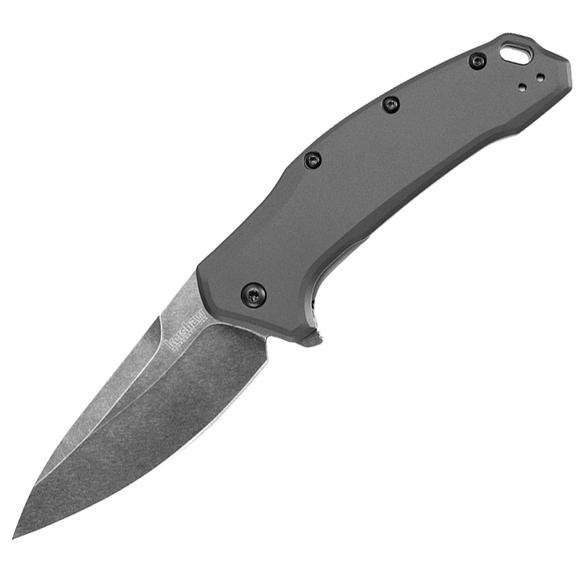 The Link is made in Kershaw&apos;s state-of-the-art manufacturing facility in Tualatin, Oregon.